Sri Lankan Prime Minister Ranil Wickremesinghe is heading to Beijing on Wednesday to negotiate a $125 million penalty that a Chinese state firm is seeking from Sri Lanka for suspending work on a big port development project. Sri Lanka ordered a review of the $1.4 billion Colombo port city project last year, citing irregularities in the award of the contract to state-owned China Communication Construction Company (CCCC) by a previous government. Last month, the Sri Lankan government, facing a difficult economy, ordered the Chinese firm to resume work on the port city, the island nation’s single biggest foreign investment project, that includes apartments, shopping malls and marinas near the capital, Colombo. But CCCC, which had estimated that the shutdown would result in losses of more than $380,000 a day, has sought compensation of $125 million, said Patali Champika Ranawaka, a minister in the Sri Lankan government. “We can’t pay, we are going to negotiate,” he said. Wickremesinghe who began a four-day visit to China to rebuild investor confidence will be discussing the compensation demand with government leaders along with a mechanism to ease the debt burden, possibly by rescheduling loans, Ranawaka said. Sri Lankan government data shows Sri Lanka has to pay about $8 billion to China in loans, a government minister told parliament last month. Asian giants India and China are vying for influence in Sri Lanka. China has built roads and ports on the island that India has long seen as its area of influence. Sri Lanka has sought to balance ties with China and India under President Maithripala Sirisena. Both Sirisena and Wickremesinghe have visited India seeking investment, but the pace of Indian activity on projects is slow, offering China a chance to gain ground. “Sri Lanka has been moving towards the middle after criticising China,” said Sasha Riser-Kositsky, Eurasia Group’s South Asia analyst. 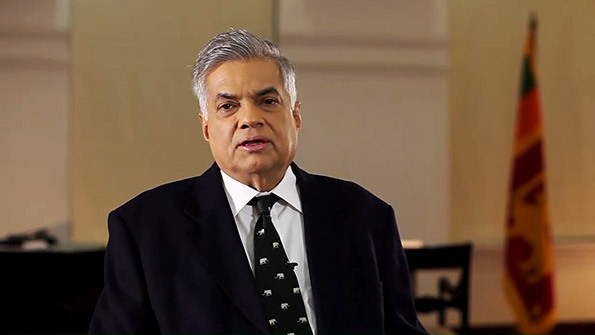 Ahead of his visit, Wickremesinghe said Colombo wanted to build long-term economic and investment relations with China. The flagship Colombo port city project would be given special status as a unique financial district with its own tax laws, he told China’s official Xinhua news agency. The two sides were also in talks on setting up a special economic zone in Hambantota in the south where China has already built a sea port and airport, he said. When asked about the disagreements between the two countries since Sri Lanka’s new government took over, Chinese foreign ministry spokesman Lu Kang said it was natural for countries, even good friends, to have differences on certain bilateral projects at certain times. “This does not impact upon the generally friendly relationship between China and Sri Lanka nor their determination to keep deepening these ties,” Lu said.